Hopper dredger supplied with 85 tonnes in truck-to-ship operation. LNG bunker supplier Nauticor has announced that it has conducted Germany's largest ever LNG bunkering operation at Elbehafen in Brunsbuttel. 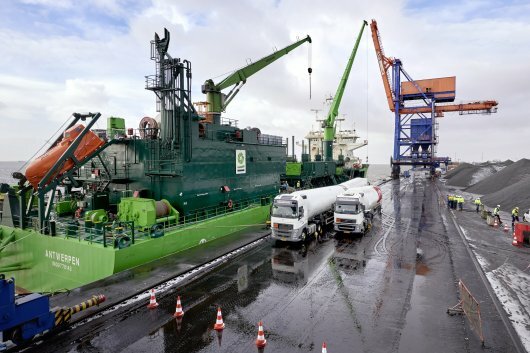 On Monday, DEME Group's 116-metre-long hopper dredger, Scheldt River, was supplied with 85 metric tonnes of the alternative fuel in a truck-to-ship operation involving five delivery trucks. During the operation, Nauticor used a bunkering technique where two LNG trucks supply simultaneously, resulting in quicker deliveries and time savings. Mahinde Abeynaike, CEO of Nauticor, remarked: "The cooperation among DEME's ship crew, the staff of the Brunsbuttel Port, and our team has worked extremely well. Together we have proven once more that the supply of LNG for larger ships in Germany is already a reality." Abeynaike noted that the company's new LNG bunker vessel is due to be put into operation at the end of this year. This, he said, "will allow us to conduct faster and more comprehensive bunker operations". As previously reported, the 7,500-cubic-metre (cbm) gas supply vessel has been developed by Bernhard Schulte Shipmanagement (BSM) and Babcock International Group, and is to be chartered by Nauticor once construction has been completed. Amongst its key features will be azimuth thrusters and pump jets to ensure high maneuverability. Frequency-driven pumps with high flow rates will allow for the fast transfer of LNG to vessels with short layovers. Offshore bunkering will also be possible using DP2 technology. Commenting on Monday's delivery, Carsten Lorleberg, Project Manager for LNG at Brunsbuttel Ports, remarked: "The bunker operation for Scheldt River in the Elbehafen shows that LNG is increasingly establishing itself as an environmentally friendly fuel alternative, and that LNG bunker operations can be integrated into daily port operations without apprehension. We are proud to have demonstrated again that the Elbehafen has the perfect conditions in place for LNG." The Scheldt River is currently carrying out maintenance dredging works for the water authority Wasserstrassen and Schifffahrtsamt Cuxhaven on the Elbe River between Cuxhaven and Wedel. "Additional LNG bunker operations for the vessel in the Elbehafen Brunsbuttel are already planned," Nauticor said. The Scheldt River is DEME's - and the world's - second trailing suction hopper dredger (TSHD) to be equipped with dual-fuel engines. The first LNG-powered dredger was DEME's 3,500-cbm Minerva. DEME has developed a two-speed propulsion drive for both the Scheldt River and the Minerva. In contrast to conventional single-speed propulsion, IHC says its patented two-speed gearbox provides fuel savings when sailing at lower speeds and that the Scheldt River and Minerva are the first TSHDs to benefit from this innovation. DEME claims its set-up, comprising two-speed propulsion gear boxes and combinatory mode propeller thrust control, produces at least 10 percent bunker savings during dredging operations.